Over 65 years ago, when a fellow broadcaster fell on hard times and was unable to receive his salary, his broadcasting colleagues came together and chipped in to support him until he was back on his feet. That initial idea became the Broadcast Pioneers, which launched similar programs within cities across the country. Today, we have the Broadcasters Foundation of America, which combined the Pioneers’ efforts and expanded outreach to the whole country. The Broadcasters Foundation of America reaches across the country to provide an anonymous safety net for radio and television broadcasters who find themselves in acute financial need. 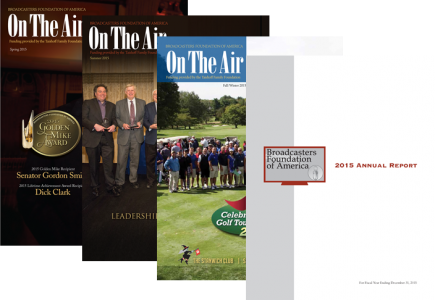 For over sixty-five years, the Broadcasters Foundation of America, along with it Board of Directors, many volunteers and countless contributors, have aided over 1,000 broadcasters and their families across the United States. President & CEO, Beasley Broadcast Group, Inc.
President & CEO, Richard A. Foreman Assoc. Meredith Corp. Local Media Group, ret. Feel free to contact us for more information about our Public Charity Status.